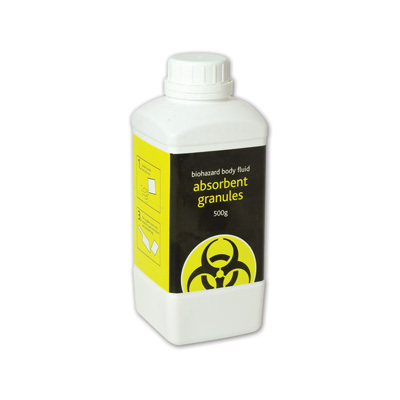 Keep hygiene to the highest standard with our Absorbent Granules. Specifically designed to aid in the absorption of bodily fluids including blood, vomit and urine, these functional granules simply sprinkle across the site location and form a gel upon contact that can be swept or scooped up easily. Remove the need for excessive paper towels and return your workplace to one of cleanliness in minutes by introducing these absorbent granules to your store cupboards. This 500g bottle has been shaped for easy grabbing and allows you to sprinkle the correct amount for each incident while then storing safely away for when it's needed again. These Absorbent Granules are also available on 10g sachets for those more uncommon incidents. Ensure you're ready for any emergency by browsing our First Aid & Medical Supplies range online today.